Situated on the Crocodile River, River House commands a stunning view of the Kruger Park from the balconies of our 12 on suite bedrooms. Apart from old fashioned hospitality we offer guests regular sightings of game from the viewing deck and swimming pool. Facilities include a chapel for intimate weddings, small conference room and self-catering unit. 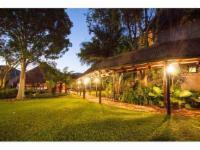 We are ideally situated for excursions to the Kruger Park, Panorama route, Swaziland and Mozambique. There are year round game drives by arrangement. River House is also highly recommended by the AA Accommodation Awards from 2000 - 2010 in the category Small Country Retreats. There are such activities as open vehicle safari drivers into Kruger National Park, either full day or morning only, Elephant rides, interaction or walk, visit a Swazi cultural village for tour, meal, traditional dancing and day excursions into both Mozambique and Swaziland. Children Policy: No children under the age of thirteen. Please take note, this is an old fashioned guest house there are no TV's, no radio's and no newspapers. Please note that the Self Catering Cottage is NOT TOURISM ACCREDITED. From booking to our stay and finally checking out, Johann made us feel so special.&nbsp; The River House is a collection of a lifetime and there are to many things to take in at one stay, i recommend going several times ;)&nbsp; Eclectic, inviting, interesting, historical, creative and welcoming are just a few descriptive of the lodge and its owner. The view from the deck and rooms is exceptional, and the collection of wildlife, just wondering past, is exquisite.&nbsp; LOVED it and would recommend everyone experience this. An eclectic guest lodge which has been built and furnished with the foremost interests of their guests as priority.Management and staff were equally professional and attentive, which ensured that our short stay was enjoyed immensely.Definitely recommended as a high quality entity with a special personal element. River House Guest Lodge is 2.2km from the centre of Malelane , the nearest airport 46km (Kruger Mpumalanga International Airport).